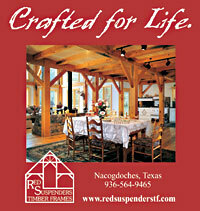 Red Suspenders Timber Frames has been designing and crafting fine timber frame homes, barns, pavilions and other structures since 1983. Our award winning team of crafts people is well versed in taking your ideas and desires, incorporating them into a cohesive design, and bringing them to life in a finely crafted timber frame structure. We bring the same high level of skill and dedication to all aspects of the process.